Are you rooted in local or regional agriculture? This past farm season, our employee, Silvia, who helped us launch a website back when we truly considered ourselves Luddites, started experimenting with posting Wildstone Farm pictures on Instagram. In searching for the best searchable tags to convey the message of our farm and our location and key markets, she stumbled across a new hashtag, #RootedinVermont. She wanted to find the most direct hashtags that someone in our customer region (Southwestern Vermont, neighboring NY, which is tricky to find a hashtag for, or the Northern Berkshires) would find. Though she didn't expect to expand our customer market, but she is really about sharing stories and experiences, and Instagram is a great medium to do that. However, she also wanted something that maybe others around Vermont that are into local food and organic farms may find. It can be enjoyable to check in briefly on social media and see via a hashtag, what others involved in local agriculture are involved in (Example: We love seeing the photos and reading the wonderful words of Jen at Woven Roots Farm, a farm which also has a 'no-till' ethic. If you haven't watched Jen's TedX Berkshires talk, see our former Blog Post). Here is an article from the Times Argus titled, "Vermonters Create Movement from Roots", by one of Silvia's good friends who is rooted in Marshfield, VT. It explains what the Rooted in Vermont social media campaign is all about. We hope it may provoke you to think about how you define your Foodshed and ability to purchase regionally, and perhaps share how you are "rooted in Vermont" and of your connection to Wildstone Farm. 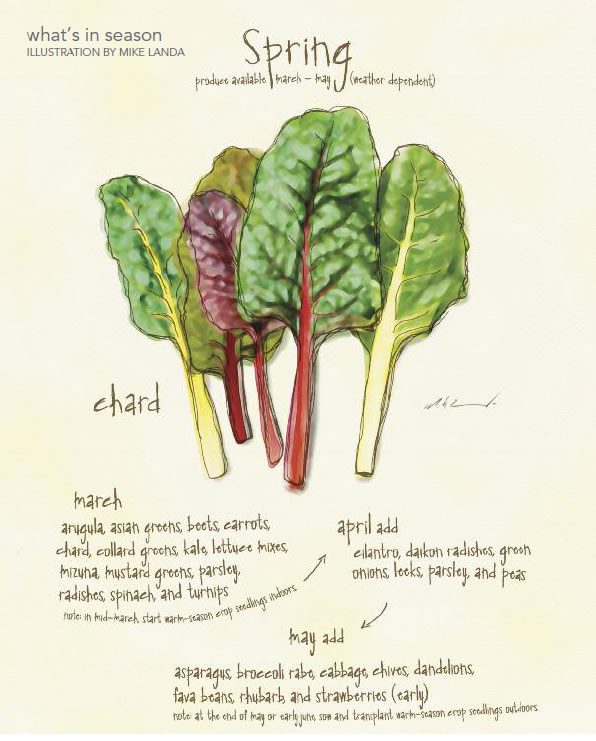 Galbraith also wrote a great article in Vermont's Local Banquet titled "Neighbors to the North- a Plethora of Produce", that got us thinking about defining our Foodshed with more of a regional perspective. As small, organic farmers we also try to support our other local farmers and producers. Sometimes it is hard to be able to afford to keep your purchases local, but we believe it can be possible with a bit of creativity. We are very thankful for some programs like Hoosac Harvest, which help to subsidize a few of our Community Supported Agriculture (CSA) shares in the Northern Berkshires to make them more affordable to some families. We ask you to keep your food purchases regional and consider joining one of our CSA shares in Southern Vermont or the Northern Berkshires (Williamstown and North Adams area). Perhaps go over the amount of money you may spend on produce at your grocer and figure out what that cost breakdown is. Do you overbuy produce and it goes to waste? Read our CSA page and offerings and see what may work for you. Maybe split a share with a friend if you're away some of summer or think a share is too large for you. Those joining the Northern Berkshires CSA Shares will have more ability, like our Farmers' Market CSA Shareholders, to customize a bit more of what you want in your Sharebox! A win-win! Still on the fence? Read this article, "How to Eat Organic Veggies for Less than $10 a Week: Join a CSA", by The Penny Hoarder. We do hope you'll join our Wildstone Farm CSA this season! ​"Local has become a buzzword around food these days, as consumers strive to purchase ever-increasing portions of their shopping list from local food sources...They’re [consumers] also driven to know the person who grew their food and keep their food dollars circulating among neighbors. On this Wednesday Wildstone Whim, we would like to share this heartfelt TedX Berkshires talk by Jen Salinetti of Woven Roots Farm in Tyringham, MA. Our farm helper and online guru, Silvia, often passed by this farm en route to her work on the Appalachian Trail in Tyringham and some of her AT friends spend a lot of time here, and she is due a tour someday soon. Tyringham is a historic valley in the Central Berkshires known for it's Quaker heritage and farming. Similar to the Valley here in Pownal, VT, it has rich soil and is prime land for farming. The Appalachian National Scenic Trail climbs down, into, then out of Tyringham and it highlights many of the scenic values people picture when they think of the Berkshires. As the farms have dwindled in recent years in this area due to a variety of reasons, there are still a few active farms (1 dairy/meat cow farm just down the road from Woven Roots Farm) in the area. Jen speaks passionately of her heritage and call to farming. It is very powerful and reminds us of what gets us up in the morning. The farm she and her husband operate uses many of the same principles we believe in to care for the soil. 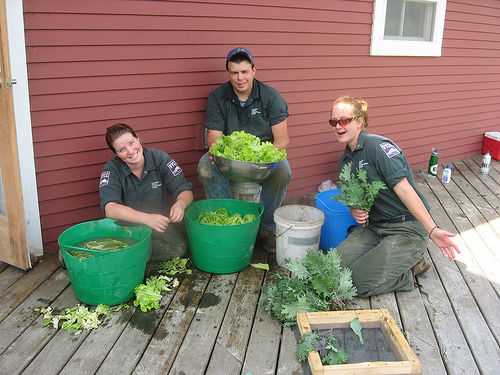 To learn more about their farm read this article published on the Berkshire Edge. Thanks Jen for the great talk! We are happy to have discovered it! 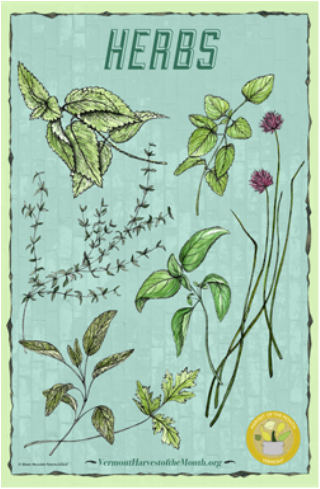 Here are a few fun resources from Vermont Harvest of the Month: Herbs. If you haven't been to their website yet, it's a great resource for at-home and for educational purposes. We just love the artwork too. Here is the main page of their newsletter. Also a great "homepage" resource list. Here are some tips for Home Uses of Herbs (also on their homepage) with two recipes. Here at Wildstone Farm we grow a selection of herbs for our own use, and for market. In working on our third website ever before our busy season is upon is, it is a good reminder to take a break and read something. Our friend and occasional farm hand, was traveling recently, and found these short farm related essays, articles, and documentary to be interesting enough to share. And practical uses of Coffee Grounds! Who knew? Food Chains: Documentary about the human cost of our food supply and the complicity of large buyers of produce. Also streams if you have Netflix.